Light color imbalances may be highlighted differently depending on the light source and the wavelengths present. The only colors the human eye perceives are a product of the wavelength of light that a object reflects, blue at 400nm false on one end of the spectrim while red, at 700 nm falls on the opposite end, and all other colors fall somewhere between. Therefore, your goal should always be to show the colors present in the print as accurately as possible, so appropriate light source that includes wavelengths across the spectrum should be an objective. Avoiding light from outside the spectrum is also another key factor in lighting. Infrared and ultraviolet light (light with wavelengths outside of the 400 to 700 nm range) is damaging to both the ink and substrate. The more direct exposure to the damaging rays, the quicker the print will degrade. One’s goal should be to minimize exposure of these rays by lighting a print as completely as possible with indirect light that has the least amount of harmful rays. 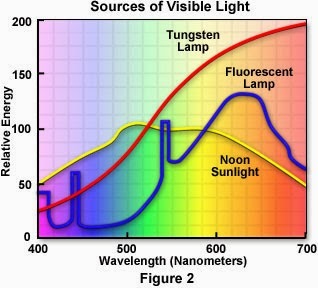 The diagrams display wavelengths of the most common light sources. The importance in accurately and consistently displaying colors is to have a constant spectral intensity in the wavelengths, so that one color does not appear brighter. If a light source lacks a 400 nm wavelength, then any of the blue colors that are comprised of that wavelength will not be visible. 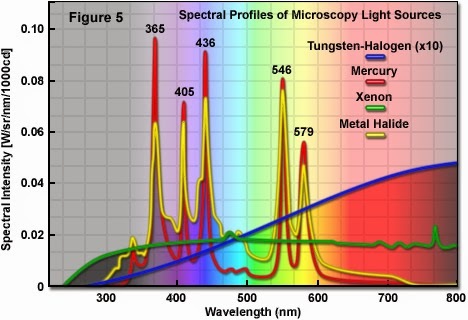 Xenon has the most wavelength consistency of any source and is therefore the best for lighting pictures; however, it is not a very common light source. A combination of halogen and tungsten bulbs is also a popular option. Light Emitting Diodes (LED) are also another option for lighting images, the majority of their light is centered in the 400-700 nm range. However, they do have variability in the strength of the light for each different wavelength.